Andres Roofing provides exceptional, high-quality, snow removal and de-icing services in order to ensure our customers properties are safe from accidents due to ice build-up and excess snowfall. 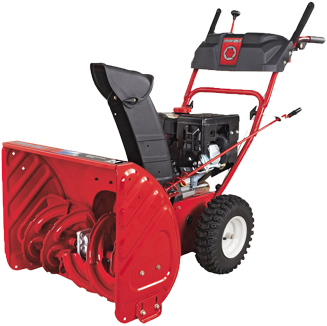 With several years experience providing Snow Removal and Ice Control services, Andres Roofing is your #1 snow removal option in Illinois. Everyone loves the snow in winter. It is beautiful, however, too much snow and your roof is not a good mix. When snow piles up it gets heavy. This can present a danger to your roof and your shelter. We all know how snow can get heavier the longer it sits. Snow melts and turns to ice. When additional snow falls it repeats the process, adding additional weight to your roof. Excess weight on your roof and can cause leaks and even cause parts of the roof to collapse. You may remove the snow yourself or hire a service. The cost of hiring a company to handle your roof snow removal far outweighs the consequences of having a collapsed, leaky roof or falling off a roof. Either way, its important to address the problem right away before the stress of the weight causes structural damage. Recent weather conditions in Chicago may result in excessive roof loads on homes and buildings due to the accumulation of snow and ice. The recent ice storms which hit the area left several snow and ice on some roofs. The recent large snowfalls have added to the total weight trusses and rafters must support. Because of this ice layer, snow which has recently fallen on the roof is not sliding off like it normally does in the winter. Since it's likely the ice layer will not melt until spring, each additional snowfall this winter will intensify the problem. This is why snow removal is imperative during winters like the one we are expecting. Snow loads for homes and buildings in Illinois are generally around 20 pounds per square foot. So how much does snow weigh? It depends. Start by asking how much water, or ice in the solid form, weighs. A one-inch layer of water or ice weighs approximately five pounds per square foot. So a roof designed for a 20-pounds-per-square-foot snow load could theoretically hold up four inches of ice. How much snow is that?Meteorologists often estimate that about 12 inches of snow is equivalent to one inch of water. Using that "rule of thumb," a roof should hold up to four feet of snow. Wet and packed snow weigh more per inch of depth, meaning that a roof may only be able to hold up to three feet of snow. This level of loading, 20 pounds per square foot, is not intended to last all winter; there is a fatigue factor. 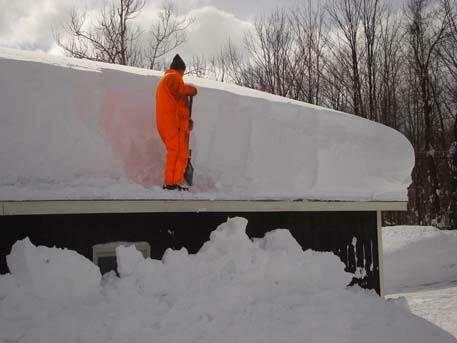 A roof may be able to support this snow load for several days or a few weeks, probably no more than 30 days. Each roof has its own weight to be considered. Shingles, underlayment and trusses all add weight to a roof even before snow falls. In short, roofs are not designed to hold much more than the existing weight. Several factors affect the amount of snow that can build up on a roof. Roof pitch--snow cannot slide off flatter roofs (3/12 pitch or less) easily. Drifting--wind blowing snow around other buildings and trees can create huge snow drifts and uneven snow loads. "Lean-tos," or roofs on other lower buildings, may "receive" snow or ice sliding off another roof above. Shingled roofs don't shed snow as easily as metal roofs. There may be roof valleys or roof areas that collect a lot of snow. So what do you do if you have too much snow on your roof? The simple answer is to get it off as soon as possible. Generally there is some time between a large snowfall event and possible structural failure. Unfortunately, one good way to remove snow from a roof is to physically get up on the roof and push the snow off with a shovel and/or broom. There obviously is the safety concern of falling off when working on a snow-covered and icy roof. That is why you should use a snow removal company like (BusinessName}. Our snow removal experts will examine your snow fall and your roof to ensure you dont incur any damage. It's important to use special ladders, safety ropes, snow removal tools. This is why a professional crew is highly recommended. Commercial roof design standard roofs are usually engineered to withstand more weight than a residential roof. Older roofs especially are not designed to with stand the weight of a heavy snow or ice storm. Andres Roofing will send a professional snow removal technician will estimate your roof and make sure you and your customers are safe. For flat ceiling buildings, putting heaters in the attic is generally not recommended. That's because of the fire danger, the difficulty of being able to provide enough heat to get the job done, and the possibility of creating ice dams along the building's eaves. Melting the snow will only create more ice and weight. Removal is the only safe solution. Call (773) 508-1723 or email us at info@andresroofing1.com today for an estimate. Our team ofChicago snow shovelers are ready to clear the way to provide a safe winter environment while delivering outstanding customer service to our clients. Andres Roofing staff will not rest until the job is completed to satisfaction. Andres Roofing stands by a policy toensure all contracted walkways are clear of snow and ice. Call us today to learn about our solutions for your property!